A successful professional cycling team requires not only an exceptional team leader but a dedicated support system. Behind the individual winning the race exists seven or eight other riders who, if the team is successful, are equally invested in the outcome. Behind the riders operate countless other individuals contributing to the common goal: directors, mechanics, soigneurs, and PR officials. On the surface exists the racers expending themselves on the road, but it wouldn’t happen without the dedication of the entire team organization. American outfit Rally Pro Cycling is a perfect example of this. The team has been consistently building success upon success since its establishment in 2008. The 2018 season will mark Rally Cycling’s inaugural season as a UCI Pro Continental team, and the organization appears poised to make an impact in their first season with second-tier status. 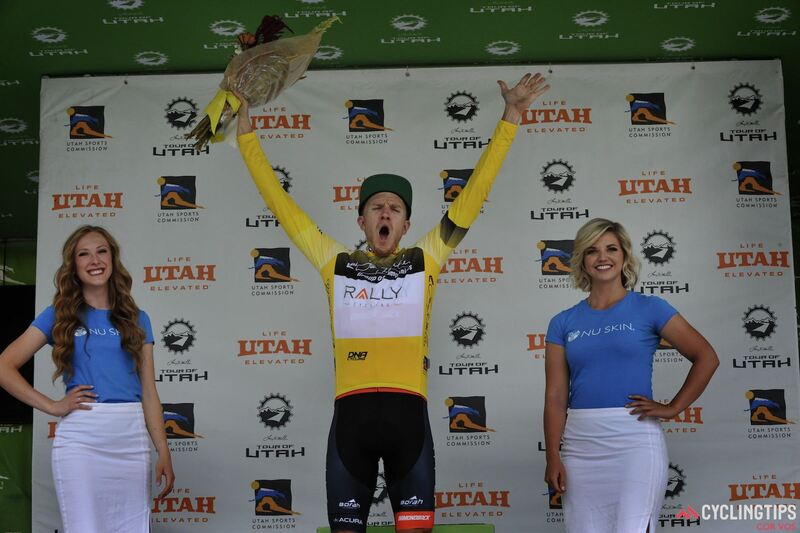 On August 6th Canadian Rob Britton of Rally took the biggest win of his career at the 2017 Tour of Utah. The 32-year old’s overall victory signals yet another result affirming Rally as well-deserving of their status upgrade. The team’s overall victory at Utah sits atop an already successful 2017 season. Team results include UCI stage wins at the Tour of the Gila, the Amgen Tour of California, the Tour de Beauce, the Cascade Classic, the Joe Martin Stage Race, and the Tour of Utah, as well as a Canadian national championship, and American U23 national championship. 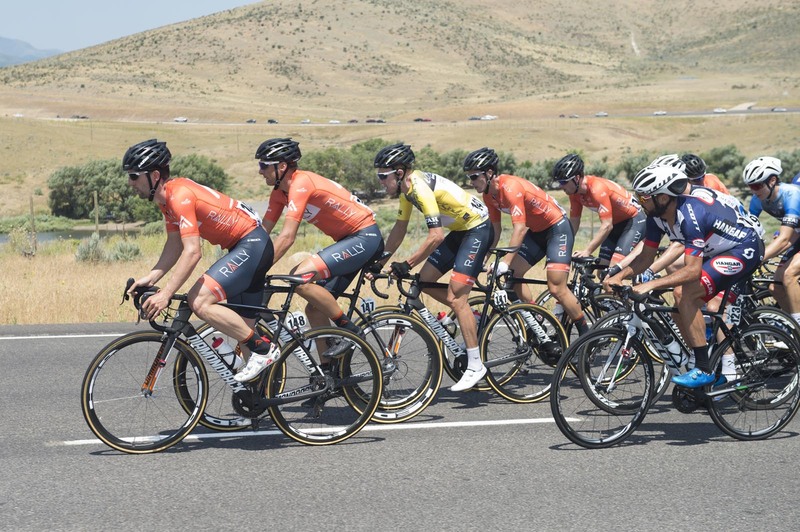 Perhaps most importantly, the team has clinched overall victories at the Tour of the Gila, with Evan Huffman, and now the Tour of Utah, with Britton — arguably America’s two hardest stage races. Britton stepped into the yellow jersey with a commanding win on Stage 3’s time trial up Salt Lake City’s Big Cottonwood Canyon. Over the next four days, his Rally teammates rode at the front and put Britton in position to defend his lead. Rally’s commanding victory almost slipped through their fingers on Saturday’s Stage 6, however. After a hectic descent off the Category 1 American Fork Canyon, the team lost organization and allowed a breakaway to roll up the road onto the flats preceding the final HC ascent of Little Cottonwood Canyon. Within the breakaway were GC contenders Brent Bookwalter (BMC Racing) and TJ Eisenhart (Holowesko-Citadel). Rally’s calculated domestique Emerson Oronte described the situation and the team’s subsequent response. A team’s response to less-than-ideal situations on the road can show its depth — or lack thereof. “Things happen on the road and you just have to assess them as they come and then plan and act accordingly,” Oronte said. Rally’s response ultimately reeled the break in within the first few kilometers of the final ascent of Little Cottonwood Canyon, delivering Britton into a perfect position on the climb. He finished with his GC companions and preserved his margin upon the summit finish at Snowbird resort. The race concluded with a demanding Stage 7 urban circuit race in Salt Lake City. CyclingTips had the opportunity to ride in the team car with director Pat McCarty for the majority of the 10-lap race, directly observing Britton’s refined support system. McCarty also spoke about the team’s overall victory in the context of their upcoming inaugural Pro Continental season, acknowledging the huge amount of behind-the-scenes work that often goes unnoticed to the outside observer. Rally proceeds into their Pro Continental debut next year with high expectations. Based on their performances at California, Gila, and now Utah, they’ll surely be competitive as they continue to learn and grow into the future. This article by Evan Hartig, used with permission, originally appeared on cyclingtips.com.